The perennial horsetail (Equisetum arvense) has been highly valued as an herbal remedy since ancient Romans and Greeks discovered its many benefits. The small plant is directly descended from a large tree-like plant that thrived 400 million years ago during the Paleozoic era, according to the University of Maryland Medical Center. Horsetail occurs throughout most of Europe, Asia, the Middle East and North America. In many parts of the world it is considered to be an invasive weed. It thrives in moist soil along riverbanks, stream beds, lake shores, bottoms lands, swamps, meadows, moist woodlands and open fields. Despite its preference for moist soil, it will also grow in barren spots. 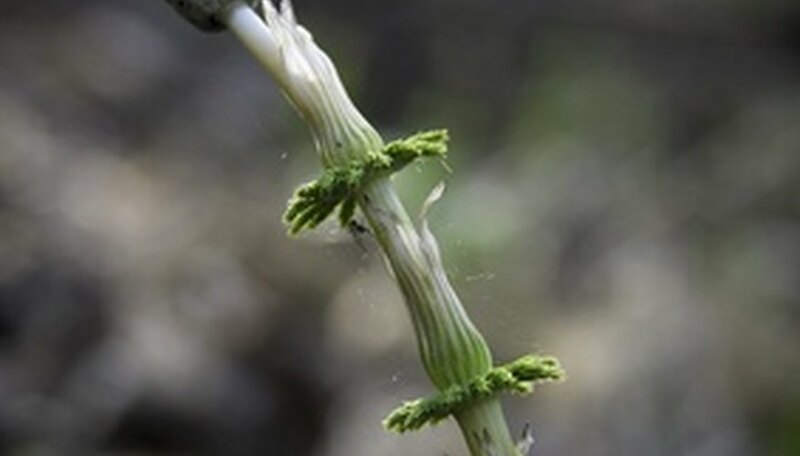 The horsetail resembles asparagus when emerging from the ground. The stems of the plant are hollow. The plant dries in the sun and forms silica crystals in the stems and branches. This gives the plant a feather-like appearance. The silica crystals are often used to polish metal, especially pewter. Silica from horsetail has also been used in the production of toothpaste, optical fibers and paint. Horsetail spreads by spores and a creeping rhizome root system. The plant is considered to be dimorphic, meaning it produces both vegetative spikes and fern fronds. The spores are born on long spikes topped with a reproductive cone. In the umbrella-shaped cone are sporophylls, which produce reproductive spores that are spread on the wind. Horsetail is a favored herbal medication used to treat urinary tract infections, minor wounds, kidney stones and osteoporosis. However, there is no scientific evidence that the herb works, according to the University of Maryland Medical Center. The stems and foliage of the plant are harvested and either dried or used fresh. If a hay contains more then 20 percent horsetail it can prove fatal to horses who ingest it. Too much horsetail causes scours and paralysis in horses, and quickly proves fatal, according to Utah State University.